Washington: David Petraeus the Director of the CIA resigned on Friday as he was Caught by FBI in extramarital Affair with his biographer. It was revealed by FBI after the course of investigation. 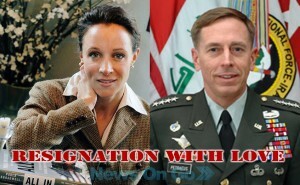 The FBI investigation began when suspicious and strange email from Paula Broadwell reported by an Individual. The FBI thought that Broadwell allegedly emailed a number of government employees and it tried to determine if any of its employees were being followed. The affair was disclosed as a result, with Petraeus being one of these employees. Paula Broadwell was his biographer. She was closed to the David Patreous and she has expanded long time in Afghanistan and they have together appearance on television. Patraeus met with President on Thursday before submitting his letter of resignation, which the president accepted. He asked Obama to accept his resignation as he cheated his wife Holly. After being married for over 37 years, I showed extremely poor judgment by engaging in an extramarital affair,” Petraeus said in a statement to CIA employees. “Such behavior is unacceptable, both as a husband and as the leader of an organization such as ours. This afternoon, the President graciously accepted my resignation.”President Obama , said that Petraeus provided an extraordinary service to the United states for decades. Petraeus was one of the outstanding general officers of his generation, helping our military adapt to new challenges, and leading our men and women in uniform a remarkable period of service in Iraq and Afghanistan, where he helped our nation put those wars on a path to a responsible end.